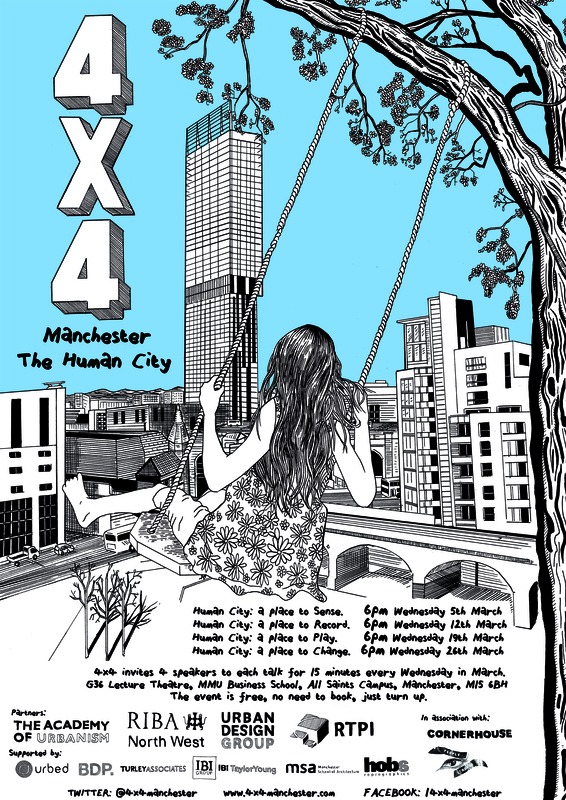 4x4 Manchester is a series of talks held every Wednesday in March 2014. 4 speakers will talk for 15 minutes each with time for lively audience debate afterwards. A Human City will look at our urban environments through the perspective of the real human experience: the overarching, never-ending, ordinary, every-day, every-person narrative that has become overshadowed in recent times by the smart city, the sustainable city, the technological city, the connected city, the living city. 4x4 Manchester wants to challenge how you think about your discipline be that architecture, art, music, urban design, planning etc etc. This will not be architects talking about their new buildings or an author promoting their new book; 4x4 wants to promote a real debate about the state of our cities, stimulated by interesting, diverse and provocative speakers. 4x4 Manchester will be hosted by Mike Mayhew, a Manchester-based artist. Supported by: URBED, BDP, Turley Associates, IBI Taylor Young, Manchester School of Architecture and Hobs Reprographics.